Very few desserts are more festive than cream puffs. Bring a plate of those bite-sized treats into a room and watch as everyone’s expression turns into a smile. I think this is why I love making éclairs and choux, or cream puffs, so much! They’re a guaranteed crowd-pleaser. I’ve been writing about éclairs, cream puffs, and other treats made with pâte à choux for years—I’ve even filmed a video class about it—so I know they can look intimidating to make. 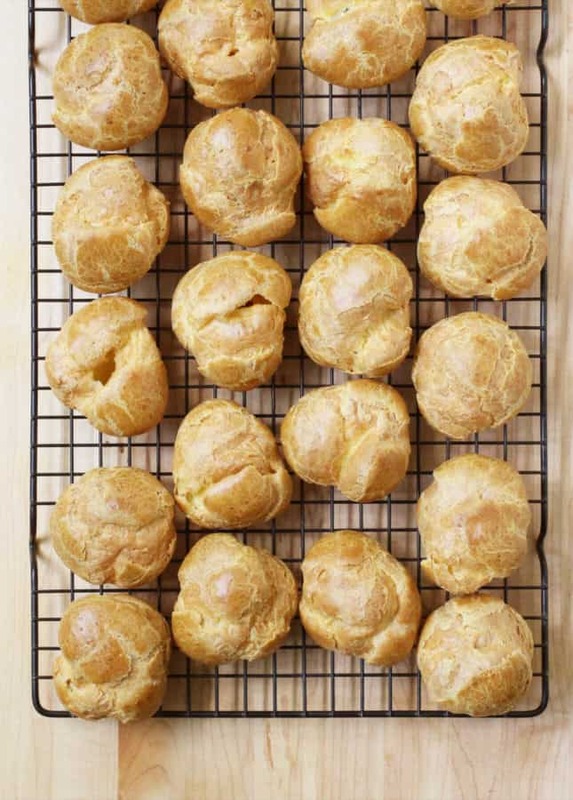 Yet, believe it or not, making choux pastry is easy; with some practice, you’ll learn to confidently whip it up in minutes. 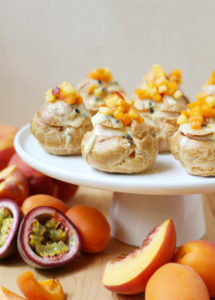 The rest is just a matter of being creative with filling and decorating the puffs. 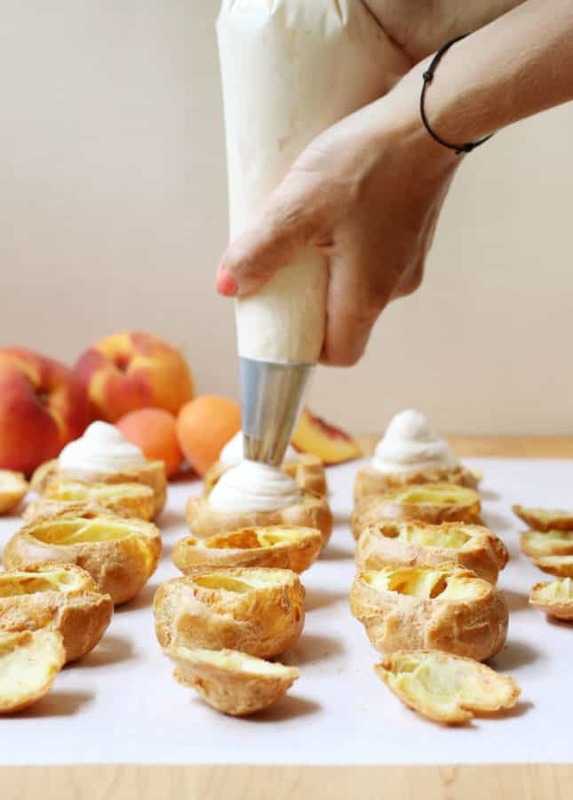 I’ve made cream puffs countless times, and as much as I like an ambitious pastry project, over time I’ve learned to take shortcuts and to churn out puffs quickly and efficiently. 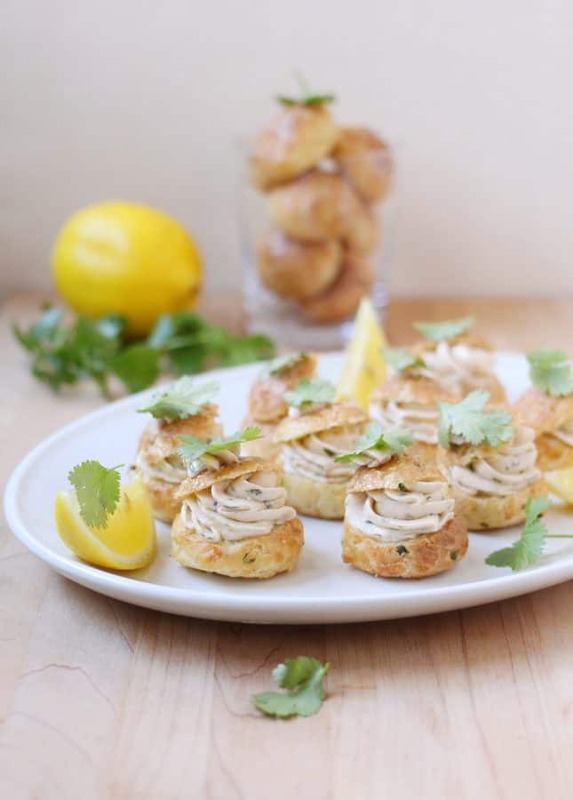 Sure, you could go all fancy and make crackling to top the puffs so as to give them that fancy pastry shop look, or make your own pastry cream to fill them. But all those extra steps add up to a lengthy project that can be off-putting. Yet, I firmly believe there should be more cream puffs in everyone’s life! Hence, shortcuts. Using a medium-sized ice cream scoop, you can shape the puffs incredibly fast. Sawing off the top of the puffs makes them easier to fill. Making a filling that combines whipped cream and jam opens a world of flavor possibilities while requiring no complicated technique. 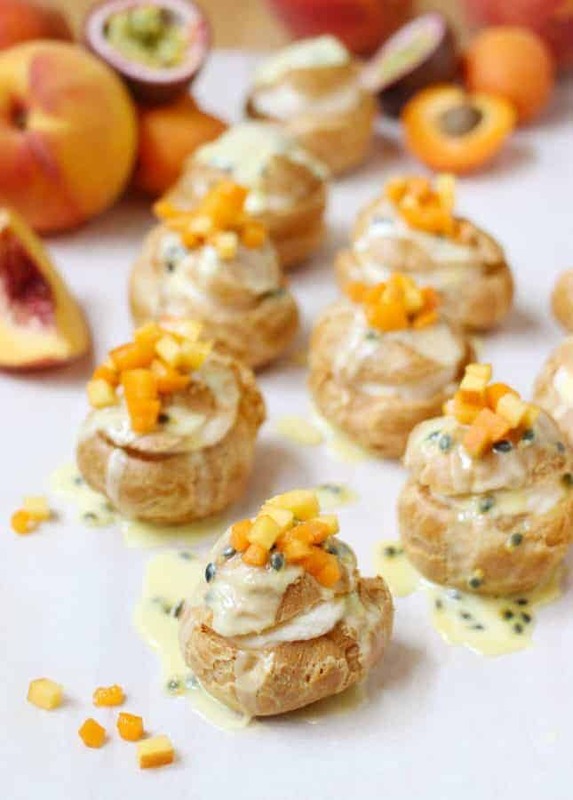 Decorating the puffs with a glaze and fresh fruit makes them look spectacular, with minimal work. 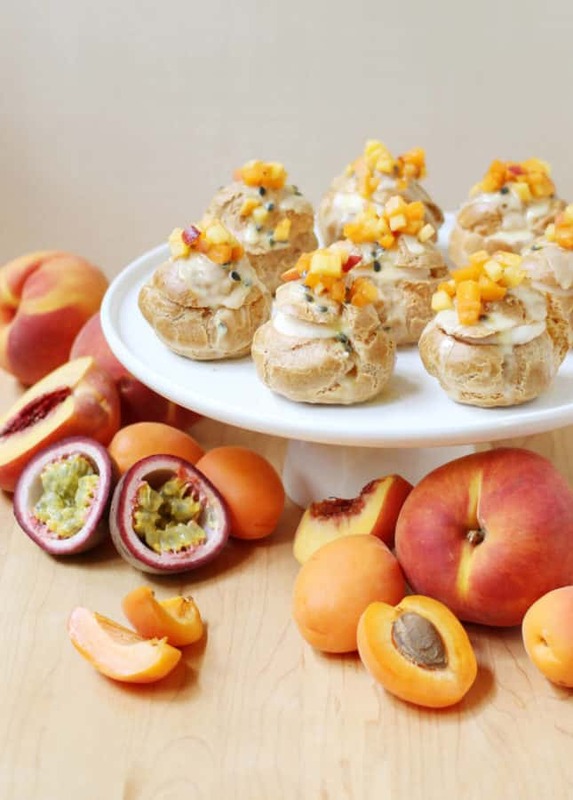 Don’t get me wrong: Making these Apricot, Peach, and Passion Fruit Cream Puffs is still a multi-step project, but it’s not a day-long one. 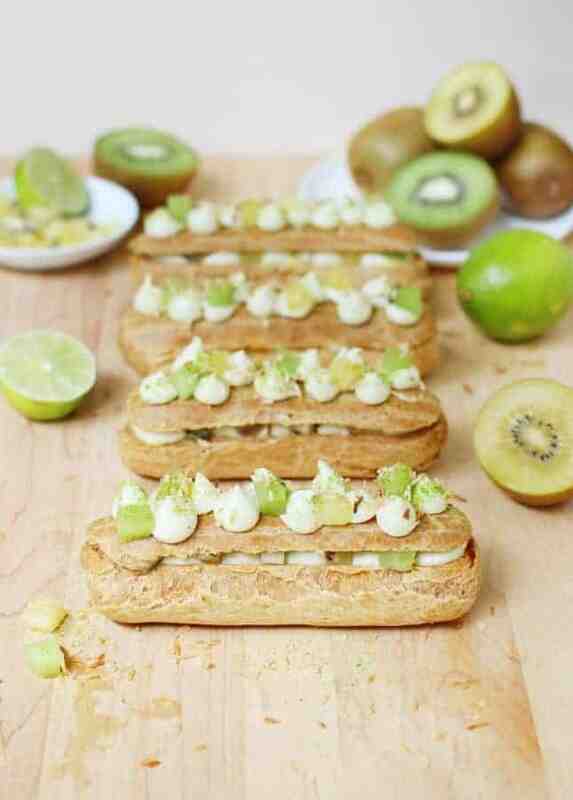 The trickiest part, if you’re a beginner, is making pâte à choux. Once that’s done and over with, the rest is fun in much the same way a craft project is. Kids can even help to fill and decorate the puffs! There’s no right or wrong way to do it; the result is simply guaranteed to be delicious. I simplified my cream puff-making process with the help of E.D.SMITH, an iconic Canadian food brand that’s celebrating their 135th anniversary this year. Considering they’ve been around for so long, it’s no surprise I’ve been enjoying E. D. SMITH’s jams as long as I can remember! When I was young, my mom put a jar on the table every morning—she’s the one who transmitted me her love of peanut butter and marmalade toast. As a grown-up, their line of Triple Fruits jams has become a staple of mine. 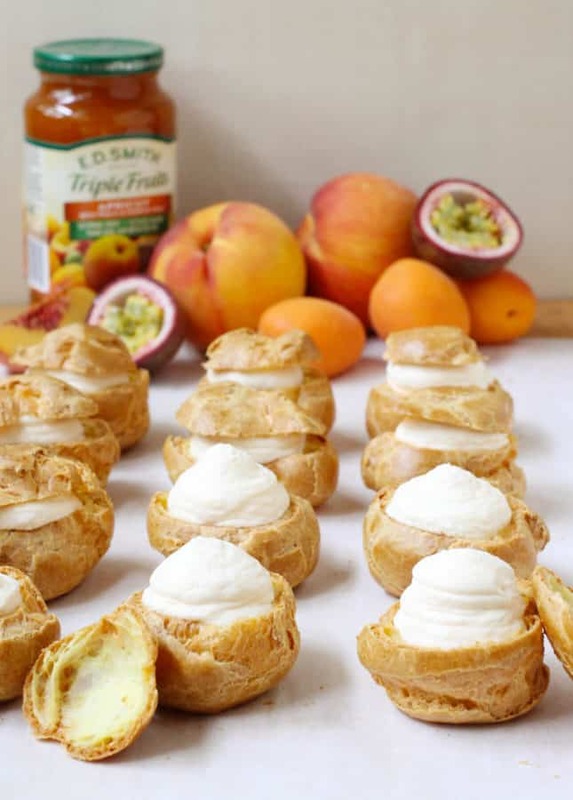 Made with “1/3 more fruit and 1/3 less calories”, they’re bursting with fruit flavor and just sweet enough to make them perfect for a variety of creative uses, including today’s Apricot, Peach, and Passion Fruit Cream Puffs. Keen for a flavor variation? 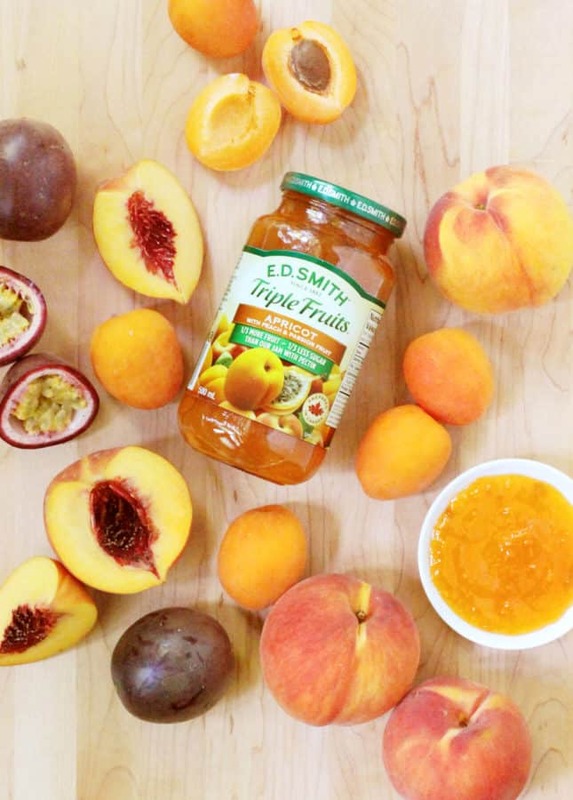 Substitute the Apricot, Peach, and Passion Fruit jam with any other variety, and make the glaze with 1/2 cup (125 ml) powdered sugar and 1 tbsp (15 ml) milk, water, or fruit juice. 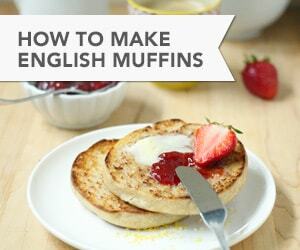 Top with the fresh fruit used in the jam of your choosing, and you’re on for a delightful treat! E.D.SMITH is having a huge, online 135th anniversary celebration and the party includes a big birthday gift—for you: A cool SMEG stand mixer! Details here. Be sure to check their Instagram and Facebook accounts to discover new and exciting recipes and learn more about their anniversary giveaway. This recipe for Apricot, Peach, and Passion Fruit Cream Puffs includes clever time-saving tips that help to make pâte à choux a more approachable project. To make the puffs: In a large saucepan, combine the water, milk, butter, and salt. Bring to a boil over medium heat. When the mixture is boiling, add the flour all at once and stir vigorously with a wooden spoon until the mixture pulls away from the sides of the pan. Continue to cook and stir the mixture for about 1 minute to eliminate excess moisture. Take off the heat. At this point, the dough mostly comes together and rolls away from the sides of the pan when stirred. Transfer to the bowl of an electric stand mixer and let cool for 5 minutes, stirring occasionally to allow the steam to come out. Set the mixer to medium speed, and beat the eggs in one at a time, making sure each egg is well incorporated before adding the next. Also scrape the bowl down between each egg addition. Every time you add an egg, the dough will separate and look like a curdled mess, but it will then come back together in a really sticky, yet somewhat crumbly way. The dough will keep on getting smoother as you add more eggs. The dough is done when it is smooth and elastic, not dry. It will be very thick and sticky. Position a rack in the lower third of the oven. Preheat the oven to 400°F (200°C). Line large baking sheet with parchment paper. Using a 1.5 tbsp (22 ml) cookie or ice cream scoop, create mounds of dough on the parchment paper-lined baking sheet, spacing them 3 inches (7 cm). 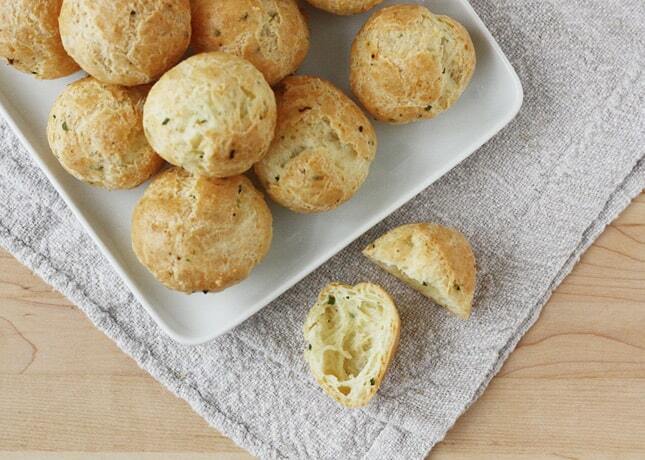 Using damp fingertips, press down any peaks of dough to create round puffs. To make the cream filling: Pour the whipping cream in a large mixing bowl. Whip to stiff peaks. Using a spatula, gently fold in the jam. Transfer to a piping bag fitted with a small round tip, or transfer to a large zip lock bag and seal, remove any excess air from the bag before you do. To make the glaze: In a small bowl, whisk the powdered sugar and passion fruit seeds until the seeds release their juice and the sugar melts into it. The glaze should be pretty stiff—it will soften as it sits. 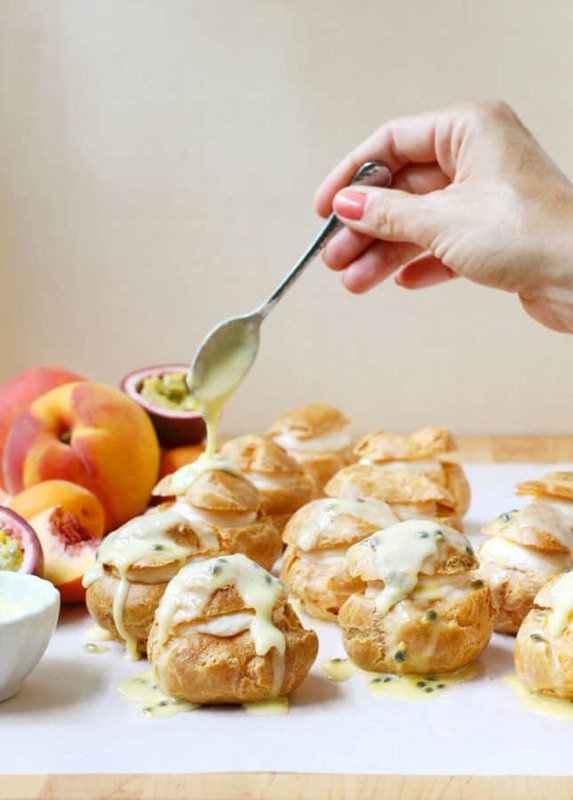 To assemble the Abricot, Peach, and Passion Fruit Cream Puffs: Cut off the top third of the puffs horizontally with a serrated knife to create lids. If you transferred the whipped cream and jam filling to a zip lock bag, cut off one corner of the bag, then push the cream down toward the tip. Using either your prepared piping bag, or make-shift zip lock one, generously pipe cream filling into each puff. Replace the lids. Spoon some of the glaze over the lids so it drips around the choux. Let the glaze set for 5 minutes, then decorate with fresh apricot and peach dice. Cream puffs are best enjoyed the day they are made. Baked, unfilled puffs can be frozen. Let the puffs cool completely to room temperature--this is super important--then transfer to an airtight container. I don't advise storing puffs in a ziplock bag, because puffs are quite delicate, so a container will protect them better. Refrigerate until cold, then transfer to the freezer. The puffs will keep frozen for up to 1 month. To defrost: Take however many puffs you need out of the freezer and set them on a wire rack to defrost at room temperature for 15 minutes. You can use them straight away, but if you want to return the puffs to their lightly crisp, freshly baked state, preheat the oven to 300°F (150°C). Place the puffs on a baking sheet and bake for 10 minutes. Remove to a wire rack and let cool completely. Fill as desired.